Great addition for your fall craft show. This will also make a cute party project! To measuring cup, add 24 oz. cut up Clear Soap and green color block to cup and heat in microwave until melted. If darker color is desired, add more of the color block. Add 0.70 oz. Fragrance Oil to soap and stir well. Fill all 12 cavities approximately 1/3 full and allow to harden completely. Shred 6 oz. White Soap using cheese grater. Set aside. Add 20 oz. cut up White Soap to clean measuring cup and heat in microwave until melted. Add 0.50 oz. Fragrance Oil and stir well. When melted soap is 135ºF or cooler, spritz green soap with rubbing alcohol. Pour soap leaving ¼ inch of space from the top of the mold cavity. 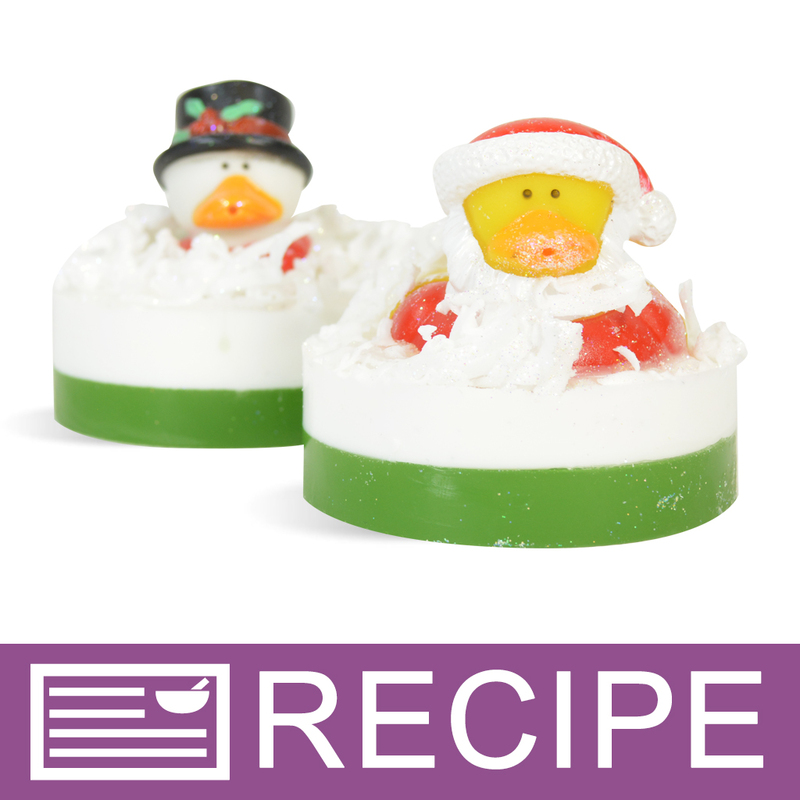 Gently place duck in the middle of white soap. DO NOT SPRITZ DUCK WITH ALCOHOL. 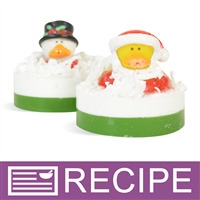 Immediately, sprinkle soap shreds over the top of each soap and then sprinkle with 1 tsp. glitter. Allow the soap to harden completely. 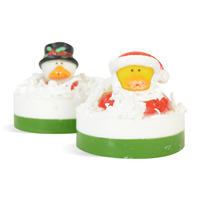 Drizzle melted soap over the soap shreds to hold together and fill in any open spaces. Allow to harden completely. Package in cello bags and tie with curling ribbon. To Use: Lather onto wet skin. Rinse off with warm water. Ingredient Label: Propylene Glycol, Sorbitol, Water, Sodium Stearate, Sodium Laureth Sulfate, Sodium Myristate, Sodium Cocoyl Isethionate, Triethanolamine, Fragrance, Glycerin, Titanium Dioxide, Mica, Iron Oxides, Chromium Oxide Green. "What size of mold do you use?" Staff Answer There are a few options you can choose from. You can use the Crafter's Choice Round Basic Silicone Mold 1602, the Round Soap Cups or even the Cupcake Round Silicone Molds.